Plot, setting and pacing are arguably the hallmarks of commercial literature. When they work, they really work. They work in Suzanne Collins’ The Hunger Games series, a series which, contrary to my expectations (Erudite much? ), I could not put down and they work in Divergent the first of Veronica Roth’s dystopian trilogy. In Roth’s world, when a person turns sixteen they have to choose to live their lives in one of five factions: Candor, Abnegation, Dauntless, Amity, or Erudite. Each faction is responsible for running one part of the world: the Amity’s grow and provide food, the Abnegation form the government, the Dauntless are the warriors, the Candor keep the peace, and the Erudite are the intellectuals and creators. Unfortunately not all is well within the factions or without. Already mesmerizing conflicts are set into place as all this choosing pits betrayal, regret, and family and community against each other and make for very compelling characters. However the characters in Divergent are not as complex as those in The Hunger Games. Collins’ female protagonist, Katniss, in The Hunger Games is almost immediately fully realized and as such the reader is sympathetic to her plight. 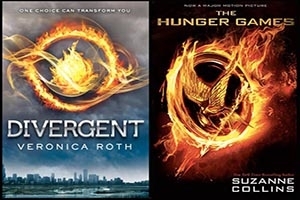 In contrast, Roth’s female protagonist, Tris, is sympathetic not so much because of who she is but rather because of her external circumstances. The reason: Collins’ is better at character development which is simply giving Katniss a moving back story. Tris on the other hand is, in many respects, boring. She’s keeps being described as wiry and strong and has no back story except that she never quite feels as home in any faction. This lack of great inner conflict makes her a weaker character. Roth’s skill in Divergent lies in its pacing and world building. Earlier I referred to myself as a bit of an Erudite; part of the reader’s fascinations with Roth’s series is wondering what choice one would have made, what fears one would have had to work through, as well as how one would ultimately face the age old question of whether one is simply a leader or a follower or whether both these traits can co-exist and it is only circumstance which dictates which is dominant. As such Roth has done a fine job mining these philosophical questions. Roth seems like a smart and perceptive writer which is why I was so disappointed with one detail in particular. In fact I abhorred it: Why is the wicked character described as having pudge and stretch marks? It would be one thing if some of the ‘good’ characters also tended towards fat and stretch marks, but they don’t and so this imbalance then is all the more glaring. In our era where body image is so darned important I think it terribly irresponsible to equate a baddie with fat and stretch marks in any novel but particularly in a novel geared towards young adults and as such impressionable young girls. No I do not think I’m harping on a minor quibble. In Roth’s August 7th 2012 blog post, she writes about how she wishes she’d made the intellectual Erudites more complex and nuanced in Divergent. Roth sounds so compassionate and thoughtful about the story telling process, an author’s choices and how story teller and story- telling merge: I wonder if she had any idea that she used pudge and stretch marks as she did.